I sat in the endoscopy waiting room at Hopkins this past Friday as I have done many times over the last two years. Jody had just completed the last of his post-transplant surveillance bronchoscopies (this was his two year bronch). Now that the routine bronch’s are complete, any ordered in the future will be to rule something out or because the doctors are suspecting something. Dr. Mathai, one of the pulmonary doctors that we’ve gotten to know through the years (not a CF or transplant doctor), had just came out to the waiting room to tell me everything went great, the lungs looked good and that Jody would be in recovery soon. I’ve heard this speech many times, but don’t get me wrong, it’s always reassuring to know that things still look good. Dr. Mathai left and I went back to a journal I’d been working on, knowing that I would be called back to the recovery area in about 20 minutes. About 15-20 minutes later (I’m guessing) a doctor came out to speak with the young women sitting in the chair across from me. She looked to be about my age. The doctor told this lady that her husband’s procedure went well and was finished but that she wouldn’t be able to go back to recovery to see him because there was a patient back there who was having problems. Unfortunately, her husband was in the bay next to the one with the problem. Apparently this patient was having chest pain and they were asking all family to leave the area. The doctor didn’t want this patient to worry about what was taking so long so she was simply reassuring her that everything was fine with her loved one. This woman was not happy, in fact she was mad, “I don’t understand! I’m family, I should be allowed to go back and see my husband!” The doctor left and she continued to complain to me about how unfair this was that she couldn’t go back to see her husband because of someone else’s. All I could do was wonder, could it be my husband? As soon as I overheard that doctor explain that a male patient was crashing (they wouldn’t ask all family to step out if it was a stable situation), my stomach tightened. I really don’t know how many bays (rooms) there are in endoscopy, I’m going to guess around 30. It’s a big unit and they are always full. The chances of that crashing patient being my husband were so slim and yet I couldn’t shake that nagging feeling. I immediately began to pray. I didn’t know what was happening but God did and even if it wasn’t my husband that person could obviously use some prayer. I waited a few minutes then picked up my phone to text a friend about the conversation I had just overheard, and to pray for Jody, “just in case.” Before I finished that text my phone rang. It was a 410 (Baltimore) area code. That number confirmed my fears… Jody was the crashing patient! He was the reason the woman next to me couldn’t go back to see her stable husband. I answered and Dr. Mathai was on the other line. He told me that Jody was in a lot of pain and that he had a pneumothorax (collapsed lung). A team was on it’s way to put in a chest tube to remove the air that was building up, causing his lung to collapse. He said he was stable (although he seemed very vague and I kept thinking of what the other doctor had said). He told me Jody would need to be admitted and that he would update me in an hour. A little over an hour the pulmonary fellow called me to say that Jody was back in recovery with his chest tube and was doing much better, I breathed a sigh of relief. Jody doesn’t remember much of what happened after his bronch since he was just coming out of anesthesia. 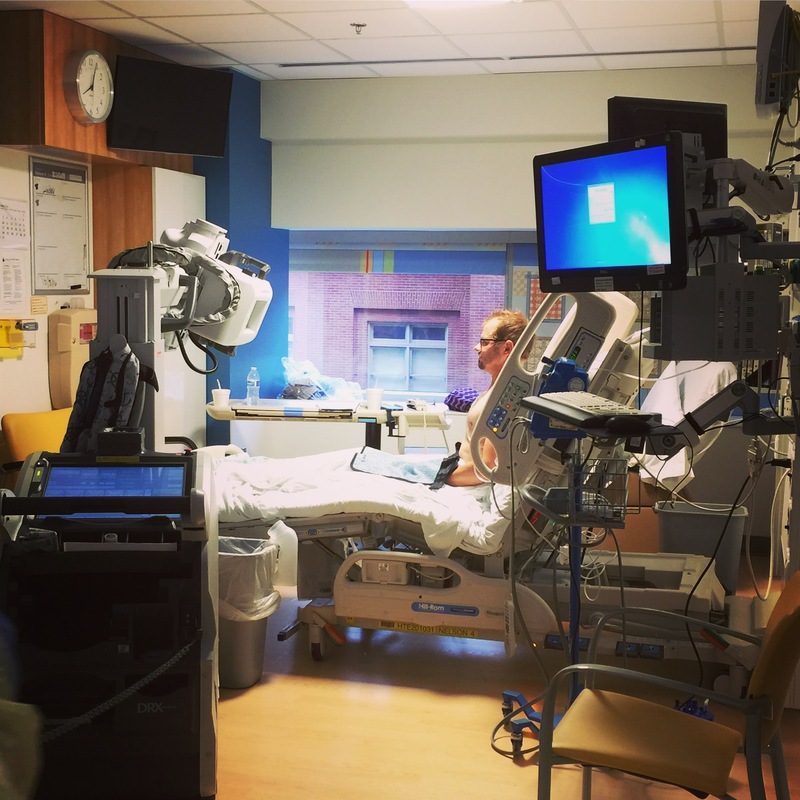 He remembers waking up in the recovery unit in excruciating pain and unable to catch his breath. He remembers hearing Dr. Mathai say, “We need to get him back to the operating room NOW and we need to get a chest x-ray to know what’s going on.” The next thing he remembers is waking up in recovery with a chest tube in his right side and a bandaged hole in his right upper chest where they unsuccessfully tried to place the first tube. His pain and breathing was much improved. That being said, it still hurt. Chest tubes are painful. You might be wondering how Jody ended up with a collapsed lung from his bronch, after all, this was probably near his 15th one and it never happened before. Every time we sign the consents for this procedure we are told of all the possible risks, pneumothorax is one of them. This complication is so rare, occurring in somewhere around 1% of all cases that no one actually thinks it’s going to happen. I mean really, think of the odds of being in that 1% group. During a bronchoscopy with biopsy the doctor inserts a scope down into Jody’s lungs, performs a lung “washing” and then takes a tissue sample. This sample is sent to the lab to check for rejection. 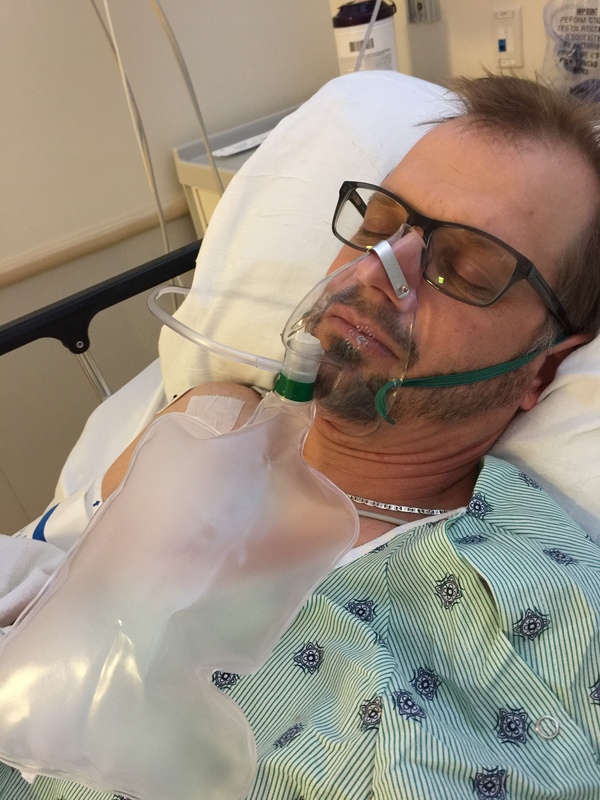 When that tissue sample was taken this time, it must have punctured Jody’s right lung, allowing air to leak from the lung into the space between his lung and chest wall. The more he breathed, the more air was escaping. This build-up of air pressure caused his right lung to partially collapse. My guess is you’ve seen the Hollywood version of this sometime in your life when a patient on a medical show is found gasping for air and someone quickly jams a syringe into their right upper chest to relieve the pressure. Suddenly the patient is able to breathe again, and with chest tube in place, allowing air to escape, Jody could too. Over the next day and a half Jody was well medicated and gradually weaned off the oxygen and chest tube. The first day his tube was hooked up to suction, which uses pressure to remove air and fluid. A CXR (chest x-ray) the next morning showed his lung was re-inflated so they switched his tube over to water seal. This allowed air and fluid to escape by gravity instead of being pulled out by suction. After four hours of this another CXR was done. It showed no new accumulation of air and so the chest tube was clamped altogether. This meant noting could drain out. If Jody had a small, slow leak in his lung, this would certainly show it. Three hours later, another CXR. Everything looked good, no air leaks. The fellow came and pulled the tube with Jody lying down in bed. It was evening by then, but she said we were free to go home and she left. Jody sat up a minute or two later and was immediately hit with intense pain in his chest. His breathing was fast and shallow as he struggled for air. When the call bell didn’t work to bring staff to the room I ran to the desk and soon we had help. They ordered a stat CXR to make sure he hadn’t developed another pneumo (unlikely but his symptoms were similar and so it needed to be ruled out). The CXR was negative and this sudden onset of pain and shortness of breath was ruled, pleurisy, a fancy medical term for irritation or inflammation of the tissues that line the lungs and chest cavity, in this case, probably the result of the chest tube being pulled. Jody was dosed heavy with IV pain medication which knocked him out, a reassuring sight after fear that he was going downhill again. All that excitement bought us another night at Hotel Hopkins. Jody only required one dose of pain medication before bed and thankfully by morning his pain was pretty much gone. We were discharged around lunchtime yesterday. Over the next few weeks Jody is not supposed to lift anything heavy. He’s also not allowed to do lung function tests for six weeks (he normally does them twice a day). 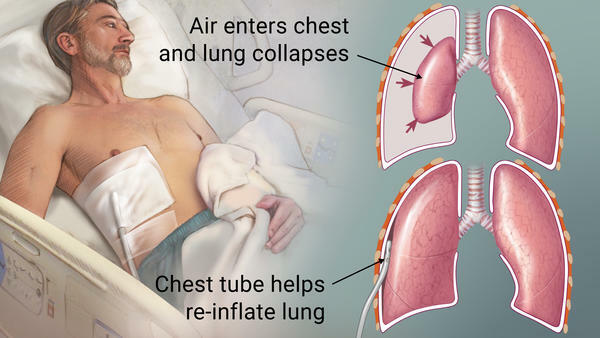 The purpose of this is to give his lung time to heal, making sure the small puncture site is securely closed and won’t break open causing another pneumothorax.